The Women’s Centre is every woman’s place for support, connections and community. Women Lead YYC is a free, six-week leadership program offered at the Women’s Centre. Women Lead YYC aims to connect, inspire and empower women who want to develop leadership skills and implement change in their communities. During my practicum at the Women’s Centre, I supported the implementation of the third cohort of Women Lead YYC . This means I had the chance to connect with a cohort of diverse and inspiring women who chose to take part. I was struck by the diversity and breadth of experiences that each woman brought to the group. While each woman had her own unique community vision, at many points, there were so many similarities and connections drawn between them. In March of 2019, the third cohort of Women Lead YYC wrapped up. This group was comprised of 17 women who got together every Monday evening for six weeks to build their skills, grow their networks and work for change. Throughout the program, women got to know each other, reflected on communities they belonged to and explored types of changes they wanted to see in their communities. Participants developed their community visions, discussed root causes of issues, and considered strategies for building relationships with allies to support their visions for a strong society. For many, the highlight of the session was the Living Library, where participants had the opportunity to learn from “human books” – Calgarian women who hold leadership positions in various spheres, from politics, to business, to activism. Participants had a chance to ask the “living books,” almost anything about their experiences as leaders, and presenters shared advice and wisdom about the paths they took to get to their current places in life. 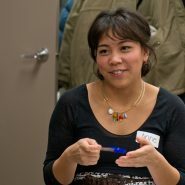 Women in Women Lead YYC Cohort Three reported feeling empowered, motivated and inspired. One woman said that “meeting other women who are activists was brilliant.” Another participant described how a meaningful part of Women Lead involved having “guidance on how to move forward on implementing change” and knowing who to connect with to implement their community vision. Women Lead YYC Will Run Again this Spring! Women Lead YYC will continue on for a fourth session! The next cohort will run from May 2nd – June 6th. Sessions will take place on Thursday evenings, with snacks provided and child minding available. Applications are due April 14th. Information on how and where to apply can be found here.